Woolly&Co. 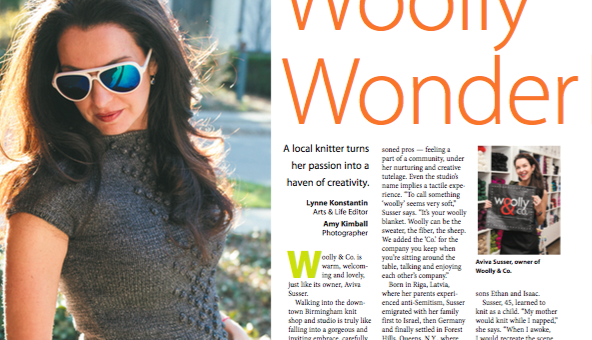 Featured in Detroit Jewish News | Woolly&Co. This article first appeared in Detroit Jewish News, which you can read here. Woolly Wonderland: A local knitter turns her passion into a haven of creativity. Woolly & Co. is warm, welcoming and lovely, just like its owner, Aviva Susser. 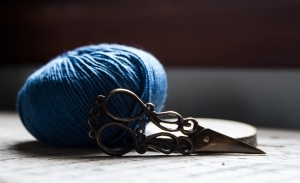 Walking into the downtown Birmingham knit shop and studio is truly like falling into a gorgeous and inviting embrace, carefully curated to make each visitor feel at home. Just opened in December, the shop is washed in white paint and natural lighting, a chic and tranquil backdrop that lets the yarn pop as the star: Luscious reach-out-and-touch-them textures cross the spectrum from fine to super-chunky, with colors both vibrant and soothing. A textural exposed-brick wall, a fireplace and comfortable sitting areas — layered with cozy handknit throws, of course — are meant to encourage shoppers to relax and lounge, read, chat and knit. Born in Riga, Latvia, where her parents experienced anti-Semitism, Susser emigrated with her family first to Israel, then Germany and finally settled in Forest Hills, Queens, N.Y., where she entered preschool speaking Russian, Hebrew and German, but no English. She attended Hebrew day school in Queens while helping her parents at the children’s clothing store they owned, before studying advertising and communications at the Fashion Institute of Technology in New York City. One summer, she took on a retail job at Saks Fifth Avenue, when Steven Susser, a young law student, walked in to shop and landed a girl. The couple soon married and moved around a few years while Steven practiced law before the Michigan native brought his bride home to Birmingham, where they’ve raised their sons Ethan and Isaac. As she grew older, she asked her mom to teach her, and made her first garment, “a cute little tunic dress,” she says, when she was 14. Last year, with her kids in high school and college, the stay-at-home mom decided to put her creative juices to professional work. “I felt like it was time to do something for myself,” Susser says. “I’ve always felt very gratified when creating or teaching, and I’ve been selling since I was 16. I’m a people person. I wanted to combine all my skills and create a community where others can come do what we love together. “I know how it feels to walk into a store and feel intimidated or overwhelmed, or that they just want to sell you something,” she says. “I don’t like to sell anyone anything they won’t be able to knit or enjoy. I offer a cup of coffee or tea, let them look around, get to know the store. That’s how I want to be treated so that’s my philosophy. ”Woolly & Co. offers products as well as classes, from private study and weekly group classes with like-minded friends to workshops (including extreme arm knitting, which teaches to knit an architectural throw on your arm instead of needles, finishing and creating a long and loopy scarf) and special events (plan a Sip and Stitch bridal shower). Susser wants to help people fall in love with knitting. “To me, knitting is such a great art form. You’re creating with your hands, but it’s also functional. You can wear it or gift it or pass it on from generation to generation,” Susser says. Visit Woolly & Co. at 147 Pierce Street, Birmingam; call (248) 480- 4354 or check out woollyandco.com.